It was discovered in 1905, the same year in which Einstein published his famous article on relativity--and yet his 1921 Nobel Prize was awarded, not for relativity but for the above equation. The thing to note is that the constant h, which appears here and is central to quantum theory, was already known in 1905. We call it Planck's constant because it was first proposed by Max Planck in 1900.
and this smallness is tied to the fact that "classical physics" of the laws of Newton and Maxwell holds fairly well as long as energies and times give a product significantly larger than h. Only on the atomic scale do the new laws dominate. The rest of this section describes what Max Planck did and is not essential to other sections here. He was not concerned with the "line spectra" of narrowly defined wavelengths (and frequencies), as emitted by individual atoms in a hot gas. Instead he wanted to explain the continuous spectrum emitted by hot solids--also known as "black body spectrum" because it is supposedly emitted by an ideal hot object ("black body") whose structure gives no special preference to any color (as happens with green grass, blue jeans and red bricks). From everyday experience we know that heated solid objects emit light, and as a their temperature increases, their dominant color moves increasingly towards the blue end of the spectrum. A warm hand emits infra-red light--invisible to the eye but detectable by organs on some snakes (also by sensors on heat-seeking anti-aircraft missiles). A blacksmith handling hot iron makes it glow a dull red, then if the coals are fanned and the temperature increases, orange. The filament of a lightbulb fed by a fading battery also glows orange, while a fresh battery makes the lightbulb glow yellow-white. And if you connect two carbon rods to a powerful battery and then let them touch (as Humphry Davy first did), a brilliant hot plasma is created (an "electric arc"), so hot that its light is rich in blue and ultra-violet. Ultra-violet harms the eye, so welders using electric arcs wear protective masks of dark glass which absorbs it and which also cuts down the brilliance. Electric arcs were also used in early film projectors. (Incidentally, like a fluorescent tube, the electric arc plasma is a"greedy conductor" which needs a coil in its circuit to keep it stable. Light emitted by the tube however comes for a rarefied heated gas and has a different distribution). All this had been studied experimentally before Planck's time. The Stefan-Boltzman law established from observations that the rate at which energy was radiated by a hot object increased steeply with its temperature T, like T4, and Wien showed that the frequency (i.e. color) of the brightest part of the emission rose proportionally with the temperature (in the direction of red to orange to yellow). The challenge was to come up with a theory explaining the emission process. By the late 1800s, several theoretical developments seemed to offer promising leads towards such an explanation. First of all, Maxwell's theory of electromagnetic waves guided Heinrich Hertz to an experimental and theoretical understanding of how such waves might be generated by a rapid alternating current. One way of creating such a current was the back-and-forth vibration of electric charge. Second, it was realized that any matter contained electrically charged components. That was first suggested by electrochemistry--electric cells and batteries that created electric currents through chemical action, and the opposite effect, the separation by such current of chemical compounds dissolved in water (or in molten salts). In later years, electrical discharges in rarefied gases actually isolated such components--tiny negative particles known as electrons and positive ions from atoms or molecules which had lost one or more electrons. And third, heat was finally understood, more or less, in terms of energy given to the random motion of ions and molecules. In a gas each atom or molecule led an individual existence, undergoing elastic collisions which passed energy from one particle to another. When the gas was enclosed in a container, the pressure of these colliding particles on the enclosing walls explained the gas laws, and the higher the temperature, the faster was their average motion. Maxwell even derived the "Maxwellian distribution" of energies around that average. Heat in a solid object was different--here the entire structure was believed to vibrate, a bit like the vibrations of the rectangular quartz crystal at the heart of an electronic watch, the kind one wears on one's wrist. The electric charges of the atoms in the object vibrated with them, and were therefore expected to radiate electromagnetic waves. The higher the temperature, the more vigorous was the vibration, and the more intense was the radiation--as was indeed observed with hot "black bodies." Many modes of vibration were expected to exist, leading to many frequencies, and this too agreed with the continuous spread of frequencies (or wavelengths--given one, you can calculate the other) coming from a hot object such as a lightbulb filament. However, theory ran into trouble when it tried to calculate how energy was shared across that spread--across the "black body spectrum." The theory of "statistical mechanics," of the behavior of many interacting heated atoms, was well developed by then, and it suggested that each mode would take equal energy. Unfortunately, it also suggested that the number of available modes was infinite, extending with no limit to smaller and smaller wavelengths, i.e. to higher and higher frequencies. But the radiated energy could not be infinite! Somewhere, one of the assumptions of the theory needed to be changed. Max Planck suggested, as a guess, that a constant h existed such that the oscillation of frequency ν in the solid body could take place only if it had available for itself an amount hν of energy. The many short wavelength modes (=high frequency modes) needed a lot more energy and became less and less likely, causing the emitted spectrum--which matched the spectrum of vibrations--to have a definite peak, and a finite amount of energy. It was just a guess, but the results matched observations surprisingly well. It was through Planck's explanation of the black body spectrum, a somewhat peripheral area of the theory of heat, that physics received its first indication of "quanta" of light with energy hν. Only later were the much more central applications realized, in Einstein's 1905 theory of "photo-electric emission" and Bohr's explanation (1913) of the Balmer series of the hydrogen spectrum. A "black body spectrum" is also expected in light from hot dense gases, where strong energy exchange exists among frequently colliding atoms. Thus, even though the Sun is a gas, the wavelength distribution in its light (upper solid line in the drawing above) is very similar to that of a black body at a temperature of 5800 degrees absolute (broken line). The few added features represent preferential absorption or emission by the rarefied outer atmosphere of the Sun, making its "blackness" somewhat imperfect. 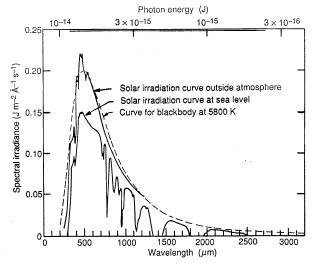 Note also that by the time sunlight reaches the ground, preferential absorption in various infra-red ranges is very pronounced; that is the famous "greenhouse effect." Maybe the most striking example of a black body spectrum was provided by the radiation emitted after the "big bang," at which the universe began, when all matter was contained in a very dense and very hot "primordial fireball." The behavior of radiation in an expanding universe is a bit like that of a gas in an expanding volume. In your home air conditioner, gas is compressed outside the house (or room), then piped inside and allowed to expand, and that expansion cools it markedly (the cooled gas then passes a radiator, over which air is blown by a fan).. The radiation emitted after the big bang has "cooled" too, which means its photon distribution, which started out very energetic, has by now had slumped to the black-body spectrum of an object just 3 degrees above absolute zero, with wavelengths in the microwave range. According to currently accepted models, that radiation started when the universe was about 380,000 years old. Before that (excluding very early stages) the universe consisted of a very hot "fireball" (3000 deg or more) whose atoms, photons and positive particles exchanged energy furiously, leading to an equilibrium energy distribution like Planck's, but at very high temperature. At that time the universe had grown big enough and cool enough (same energy, filling more space) that electrons started to recombine and form neutral atoms, allowing the electro-magnetic radiation to expand with little interference. It has been expanding ever since, as has the universe. The volume of the universe is much larger now, meaning the energy density is much lower, and since the total energy stays the same, the wavelength of the electromagnetic radiation has shifted down from light to microwave radiation. However, the "Planck spectrum" of wavelength distribution remains, inherited from the time it was first formed. The existence of this "primordial microwave background" was first confirmed in 1965 by Arno Penzias and Robert Wilson of the Bell Labs facility in New Jersey, work which earned them the 1978 Nobel prize. The energy distribution of the primordial microwaves was measured in 1990 by COBE (Cosmic Background Explorer), a specially designed NASA spacecraft. COBE's microwave detector was cooled and shielded with the help of liquid helium--necessary because anything on the spacecraft warmer than 3 degrees above absolute zero emits itself too many interfering microwaves. COBE established that the spectrum of the radiation fit a black body spectrum at a temperature of 2.73 degrees above absolute zero. When the results were first shown (figure above), the audience was amazed to see how well observations (squares) matched the expected black-body spectrum (curve), and informally dubbed the graph "fingerprint of God." It was the strongest proof yet for the big-bang theory of the origin of our universe. On 3 October 2006 it was announced that the Nobel prize in physics was to be awarded jointly to two leaders of the COBE team--John Mather of NASA's Goddard Space Flight Center, who led the effort to design and fly COBE, and George Smoot of the U. of California, Berkeley, who headed the data analysis effort. Max Planck himself was awarded the 1918 Nobel Prize for his discovery, but he also suffered personal blows: his wife died in 1906, one son was lost in World War I while another was executed by Nazi Germany for participating in a plot to assassinate Hitler. Planck stayed in Germany throughout World War II. After the war, in 1948, when the central German scientific society was re-established--it was first founded in 1911 bearing the name of Kaiser Wilhelm II--it was renamed the Max Planck Society for the Advancement of Science, and it still maintains many "Max Planck Institutes" in diverse scientific fields. *** How bright is the Sun when seen from space? *** Why does sunlight have a continuous spectrum?